This View > Exclude > menu hides or displays groups of folders defined by special attributes or other conditions as explained below. The changes you make in this menu will be displayed in the contents window (on the right) immediately. 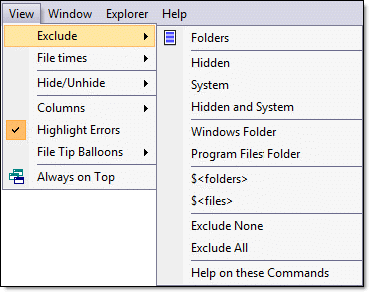 Changes to the Navigation window (on the left) will only be displayed when a folder is collapsed and reopened. This allows you to compare the before and after (left- and right-hand windows) to see how the changes affected what is displayed.